Economic data (especially global data) is not nearly as clean and straight forward as people think. This UN data shows the USA as the largest manufacturer (feel free to explore the data yourself, there is a ton of it). My guess is China is really probably in the lead. But which is first isn’t really important, the basic message is the same – they are both huge manufacturing countries. China is growing amazingly. USA is growing reasonably well (and certainly never had the massive declines people claimed). 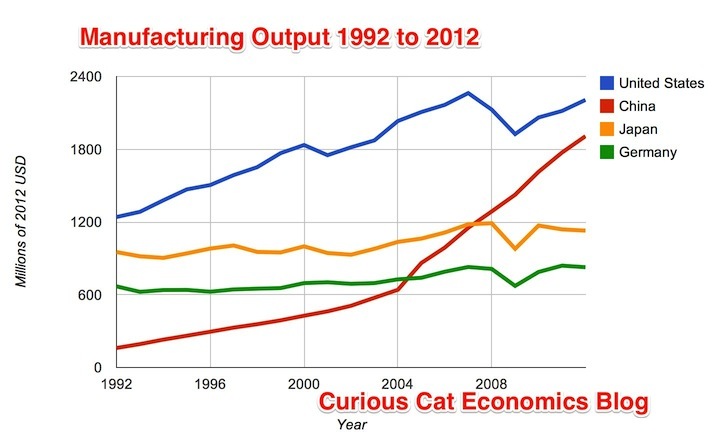 I’ll go into more detail on the data on my economics blog and will add a link when I do (also many of the links to my old posts looking at global manufacturing data discuss some of the issues and challenges with the data). As I have also written, manufacturing employment is down pretty much everywhere (even China) over the last 25 years – Manufacturing Employment Data from 1979 to 2007, Manufacturing Jobs Data: USA and China, Manufacturing Employment Data: USA, Japan, Germany, UK… 1990-2009. It is true USA manufacturing employment is down, but it isn’t a zero sum game. It is actually worse – it is a declining sum game globally – manufacturing jobs have been on a consistent global decline for decades. There has been a bit of a manufacturing boom that may put a stop to that for a few years (the global data takes a long time to become available). USA manufacturing jobs have been increasing a bit as they have in several countries. This not going to seriously dent the long term decline but may show we have reached an inflection point? We will see. About 46% of the respondents say the economy continues to be the biggest hurdle to operations, while 18% said the shortage of skilled workers is the biggest challenge they foresee in 2014. The outlook for 2014 is strong in the USA in my opinion. The economic conditions are good. The costs of manufacturing in the USA are very reasonable globally. The challenges are mainly health care and “skilled workers” (by which I would put lack of skilled and honorable executives first, though that isn’t what the people responding meant). And in some cases challenges because the dominant suppliers are not located in the USA (in some cases the suppliers have clumped production in China, Taiwan and elsewhere in Asia). Health care in the USA has been a mess for 3 decades, at least (CEOs Finally Start Getting Serious About Health-Care Reform, 2009). The costs to the economy have continued to get worse. The costs to business are enormous. The costs to people are huge both in their pocketbook, time, health and psyche. Those fighting improvement, and to instead maintain the status quo, have continually won for decades. This has to change for the good of the USA. But for now, we suffer with this big cost and still are very competitive. My guess is few respondents mention this because it has just become assumed you have to have such a horrible and costly health care system, but this just shows a failure to think systemically and long term. The health care mess would more sensibly be seen as the top hurdle to operations in my opinion. The skilled worker challenge is largely the result of poor management. First they are lousy at long term thinking, these large systems (such as the USA manufacturing workforce) are best seen with a long term vision. The executives of far too many companies ran their business on hugely foolish spreadsheet thinking to offshore production for short term theoretical gains. They also are lousy at investing in their workforce and building the skills and well being of their workforces. They continue to have executives pour cash from the treasury into the executives bank accounts while paying workers a pittance (not universal, just far far too common). And then they whine about not being able to hire the skills they want today after they have shown employees no respect for decades. Why would an employee want to work for them? The shortfall of skills and practices of the executive workforce is far greater than the shortfall of skilled front-line workers. There are challenges with finding skilled workers, but they are the type of challenges managers should fix: coach your people well, develop your workforce, build for long term success, etc.. Of course if your managers and executives spend their time doing spreadsheet management instead of gemba management they don’t know how to manage people but only how to plug in numbers into a spreadsheet or workers into an opening and have things work. If I was a manufacturing employee looking for a career, I wouldn’t consider those places run by executives that manage like the typical MBA’s that are running too many places now. They don’t have a clue about long term thinking, management at the gemba, respect of people, customer focus, systems thinking, etc.. I would love to work for a place like Toyota, Honda and probably Danaher. I would also jump at starting a career with lots of great smaller manufactures using Deming’s ideas and/or lean manufacturing (as practiced by those I have mentioned before understand how to create good lean thinking organizations). The typical big huge companies with massively overpaid executives that have no respect for people and blame lack of skilled workers for their failure I wouldn’t have any interest in working for (these companies are the ones most likely to be interviewed by mainstream media about the lack of skilled workers so the news sample is biased in my opinion). There is a bit of an issue with our education system not being what it should be but that is a minor impact on skilled worker shortage. The skilled worker shortage in a management problem nearly completely. The economy of the USA for 2014 and 2015 looks decent. Europe may even be ok. The whole system is still very risky. The massive flooding of the world with capital to cope with the destruction caused by too-big-to-fail banks and massive financial manipulation worked amazingly well in the short term. There is still a huge risk this ends very badly, which would devastate the economy and therefore manufacturing. it looks likely 2014 and 2015 are pretty safe but financial collapses are quick and strong. That could happen sooner than we expect. Manufacturing in the USA is likely to do well in the next two years in my opinion (a massive financial meltdown would change this though). John, to sum up what you are saying is the big problem is leadership. They can and do do the most damage.